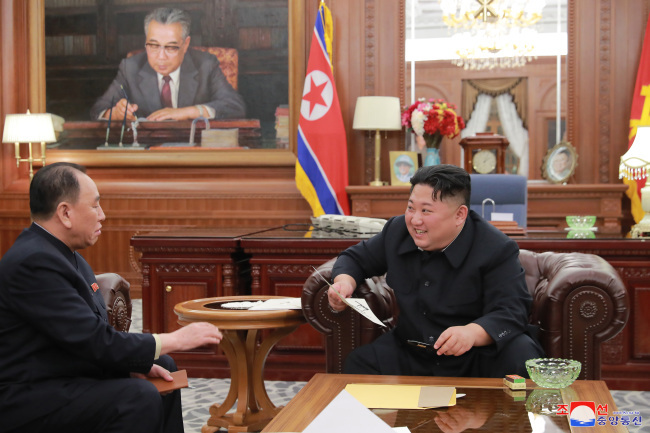 North Korean leader Kim Jong-un expressed "great satisfaction" after receiving a letter from US President Donald Trump and spoke highly of Trump's "determination and will" to resolve issues between the two countries, state media reported Thursday. "Upon receiving the good personal letter sent by President Trump, the Supreme Leader expressed great satisfaction. He spoke highly of President Trump for expressing his unusual determination and will for the settlement of the issue with a great interest in the second DPRK-US summit," the KCNA said. Kim also said he will "believe in the positive way of thinking of President Trump, wait with patience and in good faith and, together with the US, advance step by step toward the goal to be reached by the two countries of the DPRK and the US," according to the KCNA. "Expressing satisfaction over the results of the talks and activities done by the DPRK delegation in Washington DC, the US, he set forth tasks and orientation for making good technical preparations for the second DPRK-US summit high on the agenda," the KCNA said.